The Sifu Jim Fung Memorial Fund for Cancer Research (also known as the 'Memorial Fund') was established by the Fung family following the passing of the Academy's founder, Grandmaster Jim Fung, in March 2007. Grandmaster Fung (known to his students as 'Sifu Jim'), suffered from nasopharyngeal carcinoma, a rare cancer of the head and neck. The aim of the Memorial Fund is to raise donations for cancer research through lessons, workshops and social events at the International Wing Chun Academy. As of 2017, the Fund has donated $20,000 to cancer research through donations to St Vincent's Hospital and The Kinghorn Cancer Centre. We are currently raising funds to make a $10,000 donation to QIMR Berghofer (also known as the 'Queensland Institute of Medical Research'). QIMR is currently researching an immunotherapy vaccine for nasopharyngeal carcinoma. The balance of the Fund is $3,665.05 as at 17/12/2018. The Memorial Fund's first donation was made to the Medical Oncology Department of St Vincent's Hospital in Sydney on the 26th of May 2010. 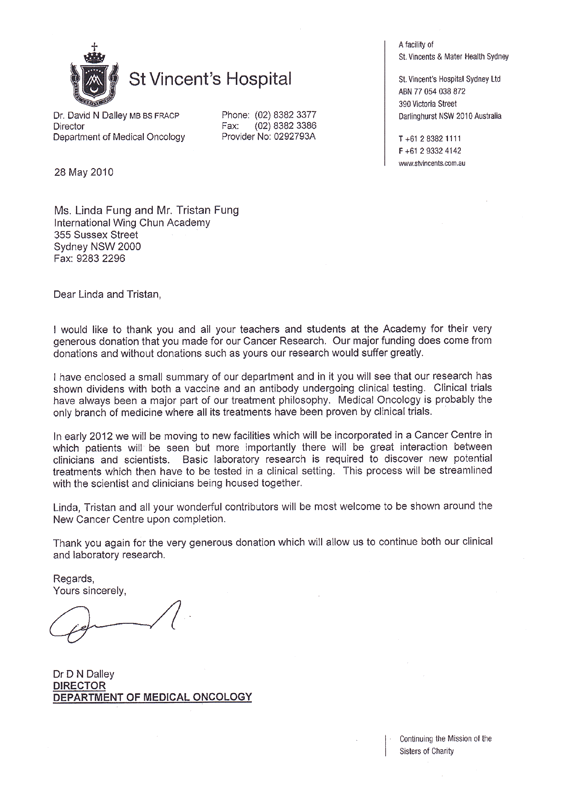 The donation was accepted by the Department's Director, Dr David Dalley, who was also Sifu Jim's personal physician. Dr Dalley said that he was delighted with the Academy's generous donation which would be spent on laboratory research into cancer treatments at St Vincent's. He said this research had already produced a cancer vaccine and an antibody which were being tested in clinical trials. At the time of the donation, St Vincent's Medical Oncology Department cared for over 700 new and nearly 4,000 follow-up patients and carried out over 3,500 chemotherapeutic treatments per year. The Memorial Fund's second donation was made to The Kinghorn Cancer Centre in Sydney on the 11th of May 2017. The donation was accepted by the Director of the Centre, Prof David Thomas, who expressed his gratitude to the Fund and pledged that the donation would be directed towards research into 'rare cancers' (such as nasopharyngeal carcinoma), which combined are more numerous in incidence than 'common cancers'. Following the presentation of the donation to Prof Thomas, Community and Corporate Partnerships Coordinator Jessica Jones took Simo Linda and Tristan Fung on a tour of the Centre and its facilities. Ms Jones thanked the Fund for its donation and stressed the importance of private donations as funding from the NSW Government and NHMRC is limited and only covers a small part of the Centre's costs. If you would like to get involved, please contact Tristan Fung at Sydney HQ. If you would like to make a donation to the Fund, we have a donation box on the Front Desk at Sydney HQ. If you wish to make a bank transfer, the Fund's account details are available upon application. We often run raffles and competitions to raise donations for the Fund. Please contact us if your business is able to donate products or services to the Fund. The Memorial Fund is not a registered charity and simply collects cash donations to pass on to our designated charity (currently QIMR Berghofer). As such, we are unable to issue receipts for donations. If you wish to make a tax-deductible donation, please contact the charity directly.